Summary: The Turtle Hospital will improve its rehab and outreach through purchasing a new rescue ambulance, upgrading the x-ray and endoscope monitors, adding four new rehabilitation tanks to replace inexpensive poly tanks, and printing 12,500 educational brochures. 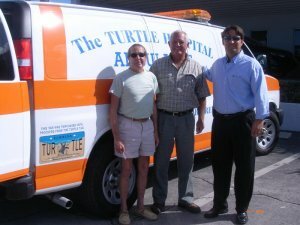 The Turtle hospital will customized a cargo van with working lights and ambulance graphics. The Turtle Hospital will upgrade the radiograph monitor to better assess an animal’s condition and upgrade the endoscope monitor to more accurately assess internal conditions and ailments. The Turtle Hospital will replace five old temporary tanks with four larger custom tanks. The Turtle Hospital will print and distribute 12,500 educational sea turtle brochures. Results: The Turtle Hospital received the grant to support the purchase of equipment necessary in order to transport, diagnose, and care for our sea turtle patients. We were able to purchase a new ambulance, and this ambulance is used every time we rescue or release a sea turtle. Our ambulance features the sea turtle license plate, and we hope this will bring attention to the need to support sea turtle conservation.